Pretty much everyone now has the means to report what is going on in the world around them. Even the most basic phone has a camera, and it is simple to post images, video and text to social media sites at the click of a button. 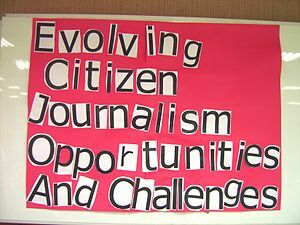 Consequently citizen journalists – ordinary people doing the job of trained reporters – are everywhere. And there are significant benefits to our understanding of the world. Particularly in straitened times, journalists can’t be everywhere at once and often arrive after the news event has actually happened. In many cases, such as during the Arab Spring, journalists can be banned or censored by regimes and individuals that don’t want stories to be reported. So citizen journalists with camera phones can be our sole source of first hand information. Much of this then feeds into the traditional media, with TV news and national newspapers running stories based on reports filed by citizen journalists. Nearer to home, the closure of many local newspapers has spurred community activists to launch alternative sites and blogs. Many of these aim to hold local councils and elected representatives to account, using the Freedom of Information Act to unearth key facts about how we are governed. All great stuff and to be praised, but there are three key reasons that we should be wary about what citizen journalists write, publish and upload. Firstly, bias. As someone that studied history, I know that bias is evident in anything we say, write or do – whether we know it or not. Professional journalists are trained to understand both sides of a story and (as much as possible) divorce bias from what they are writing. It is why the majority of stories have quotes for and against a subject in them, even if the overall tone is slanted to left or right. Citizen journalists don’t have this training and may well have an axe to grind – potentially making their reports unreliable, whether consciously or not. Second, the law. The laws of libel apply equally to the internet, as many people found out with the Lord McAlpine case. Again, journalists are trained to understand libel law and what can and can’t be said. Reddit’s coverage of the Boston Marathon bombing demonstrated what can happen when citizen journalists are given an unpoliced platform. The site’s Find Boston Bombers thread wrongly accused several people of being involved in the atrocity, leading to harassment of their families and potentially slowing down the police investigation. In today’s instant news cycle, where an unsubstantiated tweet can be front page news in seconds, there’s a real issue with potentially malicious or unthinking reports quickly making it into the mainstream news. Finally, there’s the area of copyright. Lots of news sites now actively encourage you to upload your pictures, video and text to give added perspective on news and features. The latest, the Guardian’s Witness site, provides the chance to contribute to live news and other content through a smartphone app. Content is vetted before going onto the site, with stories and videos made available to journalists for potentially developing into bigger pieces. All great, except that as soon as you post your prized video, The Guardian gets an unconditional, perpetual and worldwide licence to use it as it sees fit. You may still retain the copyright, but the paper can commercially exploit the content however it wants. Controlling how news is reported and disseminated is inextricably linked to power. Hence why dictatorships have always censored or removed the free press and run state TV stations with a rod of iron. While much of the western world has moved on from that, media is often controlled by a certain group, making citizen journalism a vital part of the opening up of reporting to everyone. But if it is to truly make a lasting impact for good, citizen journalists need to understand their own responsibilities when it comes to bias, the law and copyright and act accordingly. Events over the last week have got me thinking about social media and the C-word (censorship). Firstly, Twitter announced that it was ‘accommodating countries that have different ideas about the contours of freedom of expression’, i.e. enabling the blocking and deletion of tweets on a country by country basis. The example it gives is the legal ban on pro-Nazi speech in Germany and France, which no right thinking person is going to disagree with. The issue obviously comes when something is not to the taste of a particular regime, but a key issue that citizens of that country want to discuss. If you take the example of last year’s Arab Spring uprisings, would the tweets of protesters have been removed? At the same time the European Union has published its new Data Protection Laws, which, if passed, will become law across all 27 EU members. These include the so-called Right to Forget, which means any citizen can demand that information they have posted on social media is not just removed from that network, but the entire web. Again, this is a question of degree – removing that dodgy student photo from Facebook when you start going for job interviews is one thing, deleting a tweet from a politician that makes him/her look stupid seems to me to be completely different. None of this is new – all through history there’s been a conflict over the control of how information is distributed. In early civilisations this was pretty simple – only certain people could read/write/chisel hieroglyphics so rulers could keep a close eye on them. And if malcontents daubed slogans on the walls of public places, not a huge number of people would see them. or switching off of mobile networks, for example in Egypt last year. So, you can see Twitter’s new rules and the EU’s laws as just part of an ongoing struggle between the rulers and the ruled. However I think that social media has tipped the balance towards citizens and away from governments – it is simply too difficult to regulate, even with the support of the networks themselves. New ones will simply spring up – and the only way to combat them will be to switch off the internet entirely. And in our connected, web world that cripples a country’s ability to operate. So while censorship is still a threat it is beginning to become an increasingly empty one.